So Loving Bob & Jim! My “Guys” and Neighbors from Issaquah Highlands Years Ago! When Jim opened the door to his hotel suite at the Hotel Vintage Park this past Saturday night, I could not stop smiling! It was Jim and Bob! Many moons ago, circa 1998, I was one of the very first homeowners in Issaquah Highlands, which is now a mega-development on the Issaquah hillside. And soon after I moved in, Jim and Bob moved in next door. For six years, we were happy neighbors until Greg and I moved to Bainbridge Island. 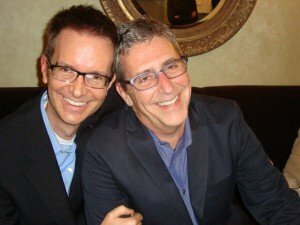 On Saturday evening in downtown Seattle, in the happy presence of thrilled family, Jim and Bob exchanged vows and got legally married, one more step in their continuing 19 year journey. And on the ferry home to Bainbridge Island later that evening, I felt so incredibly fortunate to have joined “my guys” for a sweet and beautiful lifetime moment. Jim and Bob – much love and continued happiness to you! Comments Off on So Loving Bob & Jim! My “Guys” and Neighbors from Issaquah Highlands Years Ago!